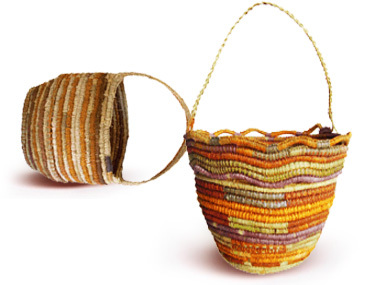 The two year tour of fibre work from the small, almost unknown Arnhemland community of Gapuwiyak is continuing with its opening in Sydney, at the Object Gallery later this month. 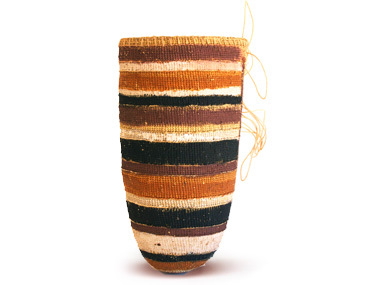 Originating from Wagga Wagga Art Gallery under the aegis of curator Louise Hamby – queen of indigenous fibre art – the effort to bring these baskets, mats, pubic skirts and animal figures to the public actually began in 1995! On the way, Hamby's investigation into the complex set of issues surrounding the making, meaning and use of fibre objects in the community earned her a PhD. Gapuwiyak's problem was its remoteness – a community established by missionaries to start an unsuccessful timber industry, it wasn't on the coast or on any major river. But it was on Lake Evella (named after the two missionaries' wives), so there were plenty of reedy materials available for weaving by the women. But everything made there had to be transported for sale to one of the larger centres nearby – Yirrkala, Nhulunbuy or Elcho island. It was not a profitable operation – since the market downgrades the beautiful, naturally-dyed fibre-work anyway when compared to the region's barks or carvings. So Hamby began this project as much as anything as a way of proving the need for an art centre in Gapuwiyak itself. And in 2009, this came about – with its first appearance in the wider world last August at the Darwin Aboriginal Art Fair. Paintings, particularly by the talented Ashley family, of images from the important Wagilag Sisters story are beginning to emerge; and fine carvings. Meanwhile, the collection of fibre work continued – Hamby now working with the local artist, Lucy Malirrmurruwuy Wanapuyngu to identify, record and save the best work; so Lucy is now credited as a curator of this show - one of the first to emerge from a tiny remote indigenous community. And Lucy will be in Sydney for the opening of what is the first ever show exclusively dedicated to this community - as will several artists. They're in town to demonstrate their craft at the Object Gallery in Darlinghurst and for students at the nearby University of NSW COFA. Women with Clever Hands sits at Object until June – and it looks as though it would be available for showing elsewhere later this year; for its final booking is as part of the Canberra Centenary Celebrations next year, accompanying the Selling Yarns conference in February.